FC Barcelona are one of the most successful football clubs on the planet with one of the best teams ever. 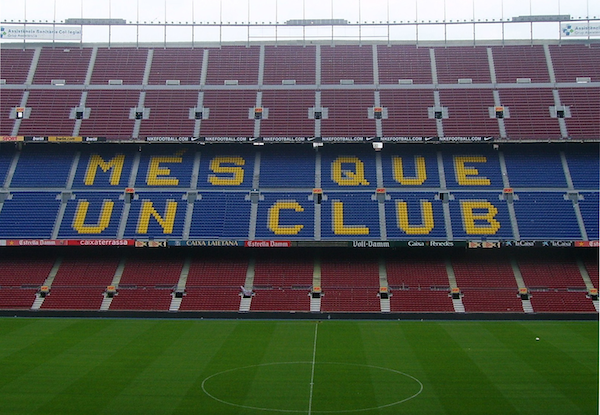 The club is based in Catalonia, Spain and has the motto “Mes que un club” (More than a club). FCB are the most successful club in Spain with their fiercest rivals Real Madrid number 2. The club is also one of the most supported teams in the world with over 50 million fans just on Facebook alone. The Camp Nou Stadium has a capacity of 99,354 and therefore tickets for most games can be purchased officially without problem. For the big games against close rivals and in the Champions League tickets can be in high demand and therefore expect to pay above the official prices. Official Tickets for FC Barcelona can be purchased from the main Barcelona website due to the extreme demand for tickets to see the likes of Messi, Suarez and Neymar then all tickets sell out to the Barcelona ‘socios’ members. In order to ensure that you get the tickets that you pay for and for them to be guaranteed we suggest that you use one of our recommended ticket websites. We have not only recommended these websites many times before to happy customers we are 100% certain that you will have zero problems with these companies. For FC Barcelona Tickets I personally would use these guys, here I have used them in the past and whilst they might be slightly more expensive than other online ticket sellers they have the best customer service and deliver all the tickets 100% of the time. Tickets for FC Barcelona can often be found outside the stadium for small games but big games such as the Champions League and Classico’s with Real Madrid are different. Tickets are in huge demand for these games and therefore we wouldn’t recommend that you purchase outside because there is no guarantee what you are buying. Fake tickets are not really an issue for most FCB games but this is not the case when the team plays against other big teams. Locals whom sell tickets can be located all around the stadium but most only speak Spanish and will often try to sell them for really expensive prices. We would not advise this method unless you really have to and to be safe ask whoever is selling you the ticket to walk you to the turnstiles so that you know the tickets are genuine. The Nou Camp stadium has one of the biggest sports capacities in the world. The stadium sells out around 5 times a year and the rest of the time the stadium always has empty seats. The seats at the very back are the cheapest but to be honest you cannot see much from such a vast difference. The biggest games of the seasons are in the latter stages of the Champions League and the games against their fiercest rivals Real Madrid. These games are referred to as “Los Classico’s” and are more than football, they are watched by millions around the world. These games are probably the biggest club games in world football and often the prices to enter these games reflect that with prices starting at €300 for the cheapest all the way up to €1000 for the seats closer to the pitch.